A friend of mine (who prefers anonymity) recently gave me a copy of this recipe, which she enjoyed. It looked healthy, fresh and flavor-packed – a wonderful complement to the weather we’re having. She said the ingredients seemed strange together so she thought of me… (strange – me?!) I modified the recipe, removing capers, substituting this for that, and it was a delicious, light vegetarian supper. A creamy dressing, perhaps a honey-yogurt based something, would keep the ingredients bound together, but would have dulled the vibrancy of the salad. 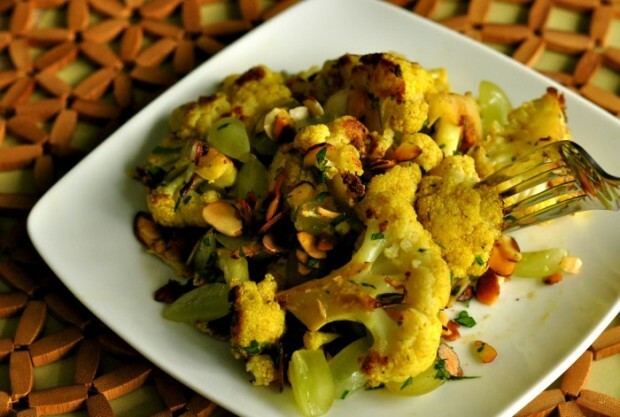 The sweet grapes and toasty nuts were the perfect counterpoint to the rich earthiness of roasted cauliflower. Sometimes I’m stymied when looking for savory vegetable dishes that are delicious served cold or room temperature. This salad will be a much appreciated addition to my repertoire. Thanks, “anonymous”! This recipe was adapted from the magazine “Garden and Gun”. I omitted the capers, and added cardamon, additional grapes and olive oil. I substituted sliced almonds for the Marcona almonds and cilantro for the parsley. Whisk together olive oil, curry and cardamon, if using. Season to taste with kosher salt and cayenne or black pepper. 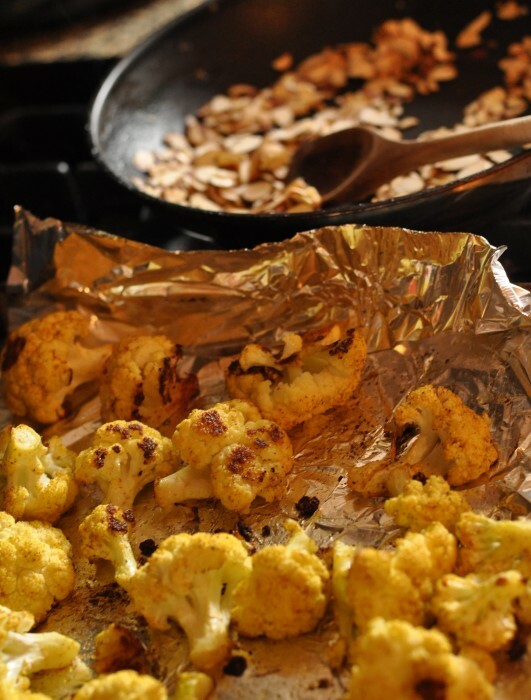 Toss cauliflower into seasoned oil, then arrange on a single layer on a foil or parchment-lined baking sheet. Bake on center rack of oven 15 minutes, or until just tender and darkened in spots. Remove from pan and refrigerate.